Supersonic fighter-bomber aircraft of variable geometry wings. It’s a mid-wing monoplane of metal construction. Its landing gear is the tricycle type with a front main wheel. The Su-22 introduced the Polish Air Force to the third generation of jets. The aircraft features the PrNK type targeting/navigation system coupled with CVM-20-22 central control computer and gyro-stabilized platform, which vastly improves the aircraft’s navigation and attack capabilities. Su-22 was the first aircraft in the PAF to possess the capability of target detection without ground visibility. It’s also equipped with modern armament systems. The Klon-54 type laser designator (for targeting guided missiles) is mounted in the front part of the fuselage. The Su-22 can be armed with highly specialized Ch-29 L/T missiles, designed for destroying fortifications of strategic importance, anti-radar Ch-25 MP missiles, as well as a wide array of various munitions including bombs and unguided missiles. The aircraft’s armament is further enhanced by two NR-30 type cannons with 80 rounds per each. Su-22 is propelled by a single turbo-jet engine ­AL‑21F3A (“S” version). The first deliveries of Su-22s to Poland commenced in 1984. 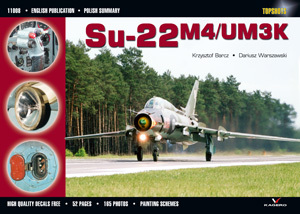 Purchased in the then Soviet Union, the SU-22M4s were the export version of the Russian Su-17M4. The aircraft were issued to the units stationed in Powidz and Piła. Those aircraft considerably augmented the combat power of the Polish Air Force. With the arrival of the first batch of 13 Su-22M4s and six Su-22UM3Ks, airfields had to be modernised and groundcrews trained to deal with the modern and much more complex design. By 1988 Poland received a total of 90 Su-22M4s and 20 Su-22UM3Ks, which remained on strength of four fighter-bomber Wings, based in Piła, Powidz, Mirosławiec and Świdwin. 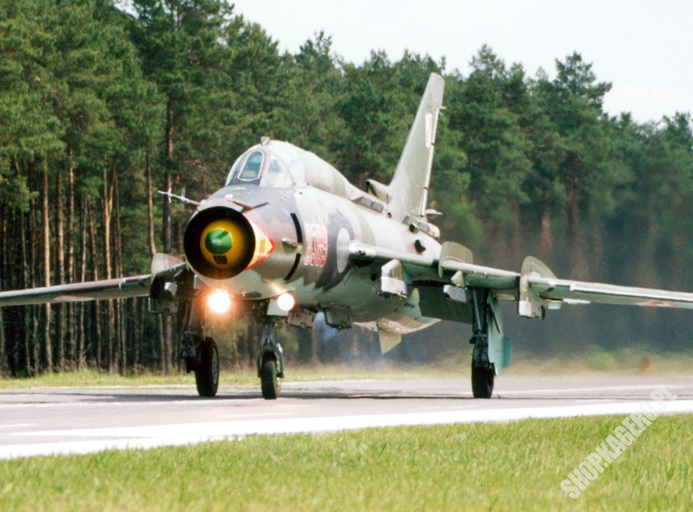 In the Polish Air Force Su-22 fulfils the role of a ground attack aircraft. When Poland joined NATO, some upgrades of the Polish Su-22s were deemed essential, so as to enable their cooperation with other air forces of the pact. The aircraft were fitted with radio transponders, a “friend-foe” identification system and, in accordance with NATO requirements, anti-collision lights. At present the Polish Su-22s are operated by the 6th and 7th Tactical Air Force Squadrons stationed in Powidz, as well as the 39th and 40th Sqns in Świdwin an the 8th Sqn. in Mirosławiec. Besides Poland, other foreign operators of the Su-22 were, among others: Germany, Bulgaria, Hungary, Czecho­slovakia, Yemen, Iraq and Afghanistan.